Welcome to our ‘2013 Energetic Overview’ Webpage. Each month we post metaphysical information about upcoming Lunar/Solar Eclipses, Solstices, Meteors, Comets etc… You are welcome to scan down the page and read the overview for each month, or click on the ‘Quick Links’ below to go directly to the CURRENT MONTHS writeup. The year 2013 or ‘twenty-thirteen’ is a pivotal point in our evolutionary awakening as we take our first energy shift steps into the Golden Age. To embrace this potential, as outlined in my book ‘Shealla-Dreaming‘, we are being called to change the way we view ourselves, to see the bigger picture of humanity in the vastness of our universe and align our lives to co-create a world based on foundations of compassion, joy, and reverence for all life. It is time to quantum leap our thinking, expand our hearts and transform our perceived limitations through the power of the Heart. Last year (2012) marked the end of the Mayan Calendar (the 13th Baktun) and we have now entered the threshold of a new cycle, a new year referred to as ‘twenty-thirteen’. The numbers ‘20’ and ‘13’ are the key numbers in the Tzolk’in calendar, the foundational calendar of the Maya. The Tzolk’in charted 20 named days with an interlocking cycle of 13 numbers creating a greater cycle of 260 named days (20 x 13), referred to as a ‘Ritual Year’ (refer Note 2). The named day on which you are born within the 260 day cycle brings understanding to your physical, emotional and spiritual journey here on Earth. The Tzolk’in was based on the number 13 as it represented the levels of ‘Heaven’ or the spiritual levels of evolution through creation. It is then thought the number 20 was chosen as it represented the total number of fingers and toes. Another way of saying this is that the numbers 13 & 20 together symbolize the expression of Heaven here on Earth, the expression of Spirit through our physical bodies. Now that we have entered 2013 (twenty-thirteen) we have the potential to take the wisdom from the old cycle, our collective galactic evolutionary experiences and begin a new cycle of heart-centred consciousness. Another way of saying this… we have the potential to transcend the pain of perceived separation through the experience of having a physical body (the number 20) and truly live a spiritual life as is encoded within our DNA, the expression of spirit through us (the number 13). The 21/22 February 2013 is prophesized as marking the beginnings of a whole new cycle of our cosmic evolution. But lets look at the lead up to this date to get a better understanding of what this means. You may experience ‘lightbulb’ moments or dreams/visions of potentials beyond your perceived limitations… take note of your experiences as they are messages from your higher-self regarding your journey this year. Be gentle with yourself as emotions maybe running high, and sleep maybe disturbed during this time. On the 18/19 February 2013 the Earth and Sun come into alignment with Cygnus x-3, a most powerful source of x-rays, gamma source and ultra-high energy cosmic rays within our Galaxy. Cygnus X-3 is a microquasar within the Swan Constellation (Cygnus), known as the Northern Cross, and represents the World Tree of Life in the Mayan Culture. As stated in Drunvelo Melchizedek’s book Serpent of Light Beyond 2012 – ‘19 February represents the beginning of a new cycle and a new world… entire heavens would be opened up… free to explore our natural environment of space, time, and dimension beyond the Earth’. (Guatemalen Mayan Prophecy). Interestingly as well, the 18/19 February 2013 marks 260 days since the transit of Venus (refer Note 3) across the path of the sun that took place on the 5/6 June 2012. Then as stated in the ‘Holisic Book of Knowledge’ by Dr Jose Jaramillo, three days of darkness will follow the Cygnus X-3 alignment, and on the 21/22 February a new humanity will be brought into existence. Its as if ‘conception’ took place during the passage of Venus on the 5/6 June 2012, followed by a ‘gestational’ period some 260 days later with ‘contractions’ and later the movement down the birth canal (electro-magnetic properties of Asteroid 2012 DA14 and Cygnus X-3) for then humanity to be birthed on the 21/22 February 2013. The 23 February 2013 then marks the first full day of enlightened beingness for all of mankind. In numerology this date adds up to the number ‘13’, the expression of Spirit through all of Creation. The above dates, and corresponding prophesies / astrological alignments give amazing insight for humanity… as Earth and all her life forms will be showered in high-frequency cosmic, gamma and powerful x-rays during this time frame. As our auric fields… right down to the trillions of cells within our body’s are being bathed in these electro-magnetic frequencies… our DNA is awakening to an evolved state of beingness in order to help us anchor 5th Dimensional light within our physical bodies. It is thought that it is these multi-dimensional high cosmic emissions that have played an important role in the quantum evolution of Earth (and our entire Galaxy) over millions of years. For example, over 775 million years or so ago single cell organisms became multi-celullar (quantum leap), then over 450 million or so years ago aquatic plants moved to land (quantum leap), then over 225 million years ago the dinosaurs flourished on Earth. We are now at the end of another 225 million year cycle (the period it takes Earth/Solar System to do one complete revolution around our Milky Way Galaxy). Thus, in this generation, at the end of once cycle and hence the beginning of our next Galactic Cycle (225 million year cycle)… we are once again ‘quantum leaping’ into the next cycle of our evolutionary journey…. what we choose to evolve into is up to us… through our hearts ! These electro-magnetic cosmic emissions that we are currently experiencing are pulsating the torroidal field of energy that surrounds our heart, helping us to ‘beat our Hearts’ in unison with the Earth (Earth’s Heart), in unison with one-another (Human Hearts), in unison with Creation (Galactic Heart). It is said that these comets most probably took millions of years to come from the Oort Cloud, a spherical cloud of matter/energy that surrounds the outer edge of our Solar System formed during our Solar Systems evolution. The Oort cloud is a mass of potentiality, possibilities that exist within the electro-magnetic torroidal field of our Solar System. Through our Solar Systems evolutionary journey, ‘matter’ is created from energy within the Oort cloud via our individual and collective heart-mind thought-forms, as well as through the collective intelligence of higher dimensions (such as the 6th Dimension of the Pleiades, 7th Dimension of Sirius, and the 8th Dimension of the core of our Milky Way Galaxay). …… and awakening deep within our DNA ‘Dreams’ of how to get there !!! The energetics of these comets are igniting within our hearts the desire to stand outside of the box of the old paradigm of non-conscious Earthly ways and dream our highest vision for self and humanity. Through our dreams and inspiration visions we transcend the problems of our world and emerge with infinite solutions. When we choose to walk the beat of our own hearts in truth, authentic love, compassion and reverence for all of life…. the dreams of our higher-selves ‘meet up’ in the etheric field… such that our single-cellular dreams join with the dreams of others to become multi-cellular dreams. These multi-cellular dreams create a new dream-template for humanity, just like the trillions of multi-cells within our body create the one organism or template called the human body. Over time, this new dream-template becomes the ‘norm’, and we find ourselves truly living in the heaven here on Earth.. where are hearts and our dreams have bridged the gap of separation, pain and fear. We are no longer competing to exist, but living in a global community, a global humanity focussed on sharing, supporting, nurturing and living life through the heart. Then on the 28 March 2013, the Maya Sun-Venus Calendar ends which marks the end of the current 52-year Venus cycle and the beginnings of the next 5000-year cycle of the fifth Sun. In the words of Maya Elder Don Alejandro: “On March 31, 2013 the sun will be hidden for a period of 60-70 hours and this is when we shall enter the period of the Fifth Sun.” The 31 March 2013 marks the anchoring and conscious acknowledgement of the weaving of Light (21 Dec 2012 – Masculine – Yang energy) and the Dark (31 March 2013 – Feminine – Yin energy) into a symbiosis of harmony and balance. EQUINOX 20 March 2013: As the Sun enters Aries on the 20th March we have the Autumn Equinox (Southern Hemisphere) and Spring Equinox (Northern Hemisphere). The Equinox is where day and night are of equal length – the energies coming together as one – Heaven & Earth, Spirit & Matter. Whilst the northern hemisphere is preparing for their re-birth as they awaken from the sleep of winter, the southern hemisphere is bringing her energy inward, in preparation for the rest ahead. It is our polarities that make up the whole. The Equinox is a powerful portal gateway to ascension into higher levels of consciousness. At this time of unity, the feminine & masculine merge as one, opening opportunities to unify duality within our selves, and expand our awareness to greater dimensional/light octave levels. Comet Panstarrs (early April 2013): Visible in Northern Hemisphere. In early April, the Comet Panstarrs (refer to my March 2013 writeup above for details of this comet) will be visible in the Northern Hemisphere in the west/north-west skies… The easiest way to find it is to draw a line from Jupiter (looks like the brightest star in the sky), through the Pleiades cluster and you will arrive at Panstarrs – just below the Andromeda Galaxy. Black Dwarf Star (2 April 2013): On the 31 March to the 2 April 2013, Earth will orbit through a portal of energy (a gravity trough) that connects our Sun with an inbound Black Dwarf Star from the Leo Constellation. This event will electromagnetically charge the Earths crystalline matrix, with the effect of potentially shifting its axis and triggering earthquakes within the ‘ring of fire’ (IMage Source: http://en.wikipedia.org/wiki/Ring_of_Fire ). The Earth has been found to have significant shifts in it’s axis every 188 days.. with the most recent events including Chile (27 February 2010 – magnitude 8.8), Christchurch NewZealand ( 4 September 2011 – magnitude 7.1), Fiji (15 September 2011 – magnitude 7.3), Japan (11 March 2011 – magnitude 9) and Alaska (26 September 2012 – magnitude 7). When we become conscious of our energetic interactions within our SolarSystem, Galaxy and greater Cosmos, then we have the potential to work with these energetic exchanges for our highest good, in reverence of all life and for the greater good of all. We have the potential to be proactive conductors or bridges of these events rather reactionary agents of fear. On the 26th of April, on the full moon we have a partial lunar eclipse (the first eclipse for the year). The full moon of the 26 April 2013 is also our first lunar eclipse of the year. A Lunar Eclipse is where the Earth blocks the suns rays from partially/fully reaching the moon. Thus in a sense the ‘past’ can be dissolved during the Eclipse as one moves forward in the now (as the moon is no longer shadowed by Earth). The lunar eclipse aspect is about working on your inner self, and illuminating yourself from within. We will be inspired this full moon/eclipse to open our gifts to higher degrees of frequency and anchor these on the Earthly plane. It is time to take ownership and acknowledge your divine magnificence… and shine brightly from within…it is time to eclipse anything that maybe holding you back. In Australia, if you live in WA you will be able to see the entire event. If you live in Eastern Australia you will be able to see the beginning Penumbral and the Maximum, but not the end Penumbral as the moon will be below the horizon. Other places to catch the entire event include: eastern Europe or Africa or central Asia. At the instant of greatest eclipse the Moon will be at the zenith for an observer just east of Madagascar. Eastern parts of South America will experience moonrise with the eclipse already in progress, but none of the eclipse is visible from North America. Wesak (26 April 2013): The April full moon is also the Wesak Moon. Wesak is the first full Moon for the year in Taurus , the time when the veil is thinnest between the higher dimensional planes (6th Dimension Pleiades, 7th Dimension Sirius & 8th Dimension Galactic Core) and the Earthly plane (1st Dimension Crystalline Earth’s Heart). This year the Taurus Sun Full Moon occurs in April, hence Wesak is in April. Due to religious/cultural followings and the gregorian calendar, there are many people who will be celebrating Wesak this year on the 25 May 2013. With a large collective consciousness focusing on this May date, this unto itself will create a potential through conscious thought-form. Thus may I suggest on the 25 May 2013 connect deeply and bring the energetics from the 26 April 2013 (Sun in Taurus full moon) into your full moon ceremonies… to honour the full potential of this Wesak in 2013. Lyrid Meteor Shower (21/22 April 2013): Every year in late April Earth passes through the dusty tail of Comet Thatcher (C/1861 G1), and the encounter causes a meteor shower–the Lyrids. The Lyrids generally begin on April 16 and end on April 26, with maximum generally occurring during the night of April 21/22. At maximum, hourly rates can reach about 10 meteors per hour. The Lyrids are particularly interesting for two reasons. First, observations have been identified back to at least 2600 years, which is longer than any other meteor shower. Second, the meteor shower occasionally experiences an outburst of about 100 meteors per hour and the reason is basically unknown. Lyrid meteors appear to stream from the bright star Vega in the constellation Lyra. Lyra is a musical instrument played by Orphius (see December 2013 writeup and the 13th Zodiac).. it is the instrument that bridges Heaven & Earth… an instruments that plays the music of the cosmos through they Heart. Thus as Earth passes through this meteor shower, and Hearts are being showered in the sounds of the cosmos, and our hearts n souls beat in the rhythm of the ONE heart of all Creation. The Eta Aquarid meteor shower is the first of two showers that occur each year as a result of Earth passing through dust released by Halley’s Comet, with the second being the Orionids. The point from where the Eta Aquarid meteors appear to radiate is located within the constellation Aquarius. The earliest Eta Aquarids can be seen around April 21 and they persist until about May 12; however, the best viewing time is on May 5/6. At this time, observers in the Northern Hemisphere are likely to see about 10 meteors every hour, while Southern Hemisphere observers will see about 30 per hour. This Solar Eclipse is the first for the year, with the second occurring in early November 2013. An Eclipse is whereby the moon moves between the Earth and Sun, obscuring Earth’s view of the Sun. The energy of a Solar Eclipse ‘obscures’ the now or potential future, and allows one to reflect on the past. Not to drag up old energy, or relive painful events or experiences, but rather to positively reassess where you have been and use this knowledge to re-adjust your path moving forward. Solar Eclipse’s create the potential for huge personal and hence planetary transformations. Here is a diagram of best viewing locations: The dark strip in the center indicates the best locations for viewing the eclipse. Here, the Moon moves centrally in front of the Sun. The eclipse is also visible in the areas that are shaded red, but less of the Sun’s disk is obscured. The fainter the red shading the less of the Sun’s disk is covered during the eclipse. On the 16 to 18 May 2013, we are in astronomical alignment with the Pleiades. Our May Lunar (partial) Eclipse, is the second Lunar Eclipse for the year (the first being in April 2013 and the third and last will occur in October 2013). A Lunar Eclipse is where the Earth blocks the suns rays from partially/fully reaching the moon. Thus in a sense the ‘past’ can be dissolved during the Eclipse as one moves forward in the now (as the moon is no longer shadowed by Earth). The lunar eclipse aspect is about working on your inner self, and illuminating yourself from within. We will be inspired this full moon/eclipse to open our gifts to higher degrees of frequency and anchor these on the Earthly plane. It is time to take ownership and acknowledge your divine magnificence… and shine brightly from within…it is time to eclipse anything that maybe holding you back. Here is a diagram of best viewing locations: During the event, the Moon will be visible from the Americas and western Africa. In summary….. I really feel MAY 2013 is going to be a big shake up month for many people, a month where we are being called to stir up the pot, take action and make changes within our lives. Most importantly as we are being pushed to make these changes quickly, it will be a time to get out of the analytical ‘head stuff’ and be the ‘intuitive heart stuff’. TRUST is the key issue here, and as we listen through our Hearts we are free from the constrains of our ego and willing and able to be the infinite power that is present through our Hearts. I feel this is going to be a month where the ‘cracks’ in peoples armour begin to give way… so look out if you have been hiding behind your fears/what you think people expect of you !!! If you are resisting this process (trying to glue the cracks back together and hanging on as if you life depended on it), well look out… as this month maybe be one of the most challenging months you have encountered so far in 2013 !!!! Lyrid Meteor Shower (10 to 21 June 2013): This month we have the June Lyrid Meteor Shower…this shower is active during June 10 to 21, producing predominantly blue and white meteors at a maximum hourly rate of 8 per hour on June 15. Lyrid meteors appear to stream from the bright star Vega in the constellation Lyra. Lyra is a musical instrument played by Orphius (see December 2013 writeup and the 13th Zodiac).. it is the instrument that bridges Heaven & Earth… an instruments that plays the music of the cosmos through the Heart. Thus as Earth passes through this meteor shower, and Hearts are being showered in the sounds of the cosmos, and our hearts n souls beat in the rhythm of the ONE heart of all Creation. Solar Flares: Solar activity is on the increase as our Sun reaches solar maximum (occurs every 11 years). As the Sun reverses it poles, large releases of energy ‘flares’ burst out, and the electro-magnetic frequencies and radiation emitted is experienced here on Earth. Auroras: With all the Solar Activity happening last month, the most amazing Auroras have been visible around the world. Auroras are caused by the collision of energetic charged particles (eg Solar emissions) with atoms in the high altitudes of the atmosphere. The metaphysical understanding of Aurora’s comes from our ancient ancestors, most notably the Lemurians and early Atlanteans. Metaphysically, the energy of Aurora’s ripples throughout our energetic body’s (auric field), awakening our pineal gland and hence resonating our primordial cells (the first 8 original cells of life). The awakening stimulates a communication pathway between these two sacred energy portals that helps humanity to ‘see’ beyond the illusionary veils of separation, and awaken to a deeper truth about life and creation itself. We can use the ‘colours’ of the aurora to stimulate the DNA associated with the respective Chakra (eg Green Aurora relates to the Heart Chakra) and hence the chakras associated physical body Organs, Endocrine Glands & Nervous System Plexus’s. Aurora’s awaken us to the fact we are not victims and have the potential awaken our DNA to higher potentialities. This will mark the shortest day of the year in the Southern Hemisphere (daylight hours) due to the tilt of our Earth. It is a time of inner reflection, turning to the Sun within, our solar selves. It is a time to gain strength from within, and get ready to embark on the new journey as our days of daylight get longer, and we are being energised from within. This will mark the longest day of the year in the Northern Hemisphere (daylight hours) due to the tilt of our Earth. As we commenced our journey from the last Winter Solstice we have been energised from Sun in our Heart through to the Divine Heart of all creation. We now reach the peak of growth – and it is a time of celebration for all. As the days then become shorter, it is a time of inner reflection/review as we move toward the next cycle. Super Full Moon (23 June): This full moon is not only the closest and largest full moon of the year. It also presents the moon’s closest encounter with Earth for all of 2013. The moon will not be so close again until August, 2014. Delta Aquarid meteor shower (late July – early August): The Delta Aquarid meteor shower in July favors the Southern Hemisphere and tropical latitudes in the Northern Hemisphere. The meteors appear to radiate from near the star Skat or Delta in the constellation Aquarius the Water Bearer. The maximum hourly rate can reach 15-20 meteors in a dark sky. The nominal peak is around July 29-30, but, unlike many meteor showers, the Delta Aquarids lack a very definite peak. Instead, these medium-speed meteors ramble along fairly steadily throughout late July and early August. An hour or two before dawn usually presents the most favorable view of the Delta Aquarids, assuming the moon is out of the way. In late July, 2013, the rather faint Delta Aquarid meteors will be at least partially drowned in the light of a bright last quarter moon on July 29. Try watching in early August, when the Perseid meteor shower is building to its peak and the light of the waning crescent moon is less obtrusive. The absence of the moon in 2014 will make next year a favorable one for watching the Delta Aquarids. 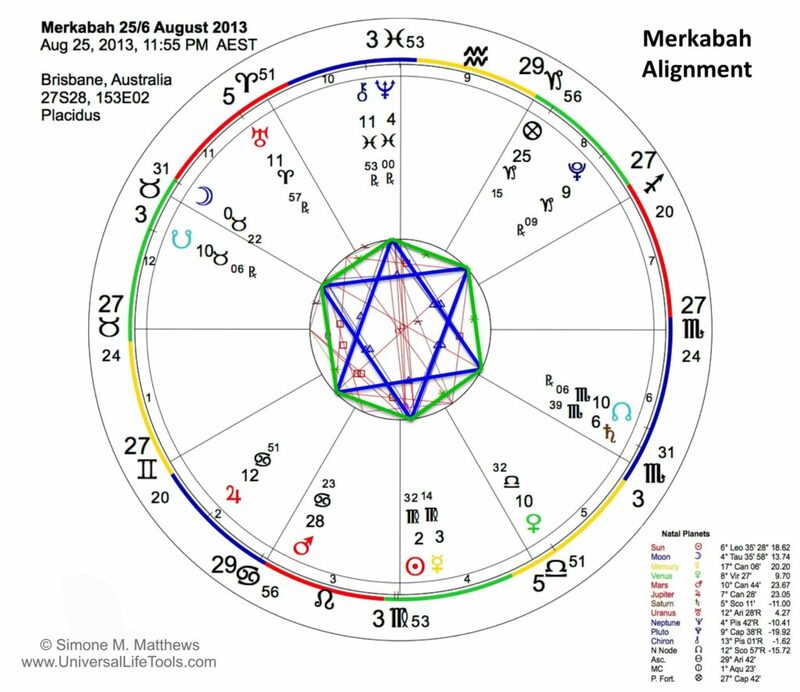 Grand Sextile – Merkabah Alignment – 29 July 2013: In July & then in August 2013 we will experience within the celestial heavens a stargate ‘Merkabah’ portal… set to quantum leap our DNA. This is a VERY RARE twin Merkabah alignment of most divine potential ! Firstly…on the 29/30 July 2013, on the last quarter waning moon, our planets will align in a 6 pointed star formation within our skies commonly referred to as a Star of David formation. The synergy of this alignment will activate the Star of David forming an energetic counter-rotating Merkabah (refer to my article on the Merkabah to understand this formation in more depth). Secondly… on the 25/26 August 2013, a second Star of David and energetic counter-rotating Merkabah will be formed by the planetary alignments (see details below under August 2013). These Merkabah portal gateways are providing opportunities for humanity to move beyond fear, pain struggle… and expand our consciousness beyond the limitations imposed by cultural, familial and societal belief systems. Please read my full article as well as download a ‘Crystalline Merkabah Grid’ to use over July/August 2013. Lions Gate Portal – Peak 8 to 12 August 2013 (full portal 26 July to 12 August 2013): With the Sun in Leo, the 8 to 12 August 2013 represents the peak of the ‘Lions Gate’ portal (the full period of the portal is from the 26 July to 12 August). Sirius (Universal Gateway) is a Sun, and the Sirian consciousness of this body is the keeper of esoteric wisdom, the scribe the universal intelligence, the masculine 6 Dimensional Frequency within our Milky Way Galaxy as it pertains to Earth (Pleiades is the 6D Feminine consciousness). As channelled by Celia Fenn ‘Many have asked us, what is the Lion’s Gate and why is it named for the Lion? Well, it refers in part to the fact that the Sun enters into the sign of LEO at this time, and these energies are integrated into the Earth under the energy of the Lion, the Feline Energies of Sirius which are fierce and proud and very “royal”. The “Gate” or “Stargate” is a period of approximatley two weeks in which a vortex opens and a wave of intense Light from the Galactic Center is recieved on the Earth. This “wave” contains the new Light Codes for the Evolution of the Earth for the next year/cycle, and so it is known as the Planetary New Year. The Star system of Sirius has always worked closely with the Evolution of the Earth, assisting where possible. The Sirians assisted in the etsblishment of the Ancient Egyptian civilization after the Atlantis trauma had destroyed all previous civilizations. The Egyptian civilization carried the “Star Wisdom” and “Creation History” of the Elohim, which was transmitted to the Earth by the Sirian Wisdom Keepers. In Ancient Egypt the Sirians were the Mediators between the Galactic Council at the Central Sun and the people of Earth. Each year, between the 26th of July and the 12th of August, a new wave of Galactic Light from the Central Sun would be directed towards Earth and magnified by the Sun in conjunction with the Heliacal Rising of Sirius in the North. The Sirians would accept this energy into the Pyramid complex at Giza and then transmit the Codes into the Earth Grids, allowing for a peaceful and fluid transmission of the Energies. After the Giza Stargate was closed, the Earth transmissions were still mediated via Sirius, but they were not received coherently by the Earth, and so the Earth’s evolution was slowed and even distorted for a while. However, in the last ten years, the Earth has ascended into the Fifth Dimension and has “graduated” to Full Member Status of the Galactic Council, and now the Lion’s Gate transmissions are being received directly by the Earth and by the Council of Elders and the Earth Keeper Council and distributed via the new Crystalline Earth Grids. In this way, the Evolution of the New Earth will follow the “directions” of the Light Codes that are received from the Galactic Council and the Great Central Sun. Sun Pole Reversal: Now talking about the energy of our Sun…. NASA reported on the 5 August 2013 that the sun’s vast magnetic field is about to flip. “It looks like we’re no more than 3 to 4 months away from a complete field reversal,” says solar physicist Todd Hoeksema of Stanford University. “This change will have ripple effects throughout the solar system.” The sun’s magnetic field changes polarity approximately every 11 years. It happens at the peak of each solar cycle as the sun’s inner magnetic dynamo re-organizes itself. The sun’s polar magnetic fields weaken, go to zero, and then emerge again with the opposite polarity. This is a regular part of the solar cycle.” I will be talking about the energetics of the Sun’s Pole reversals in both of my Shealla-Dreaming Self-Study and my Soul Evolution Self-Study Courses. Meteor – China – 1 August 2013: Meteor crashed at a dump site in a village of northwest China around 02:00 local time on Thursday, August 1, 2013. Meteorite impact left a 3 meter wide and 2 meter deep crater. Though it is unclear what the source is, currently, Earth is showered by annual Delta Aquariids which peak around July 29 – 30. The parent body of the Delta Aquariids is not known with certainty but, lately, Comet 96P Machholz is the most likely candidate. 96P/Machholz has an estimated radius of around 3.2km. Perseids Meteor Show – Late July to 23 August 2013: This is the most famous of all meteor showers. It never fails to provide an impressive display and, due to its summertime appearance, it tends to provide the majority of meteors seen by non-astronomy enthusiasts. This meteor shower gets the name “Perseids” because it appears to radiate from the constellation Perseus. An observer in the Northern Hemisphere can start seeing Perseid meteors as early as July 23, when one meteor every hour or so could be visible. During the next three weeks, there is a slow build-up. It is possible to spot five Perseids per hour at the beginning of August and perhaps 15 per hour by August 10. The Perseids rapidly increase to a peak of 50-80 meteors per hour by the night of August 12/13 and then rapidly decline to about 10 per hour by August 15. The last night meteors are likely to be seen from this meteor shower is August 22, when an observer might see a Perseid every hour or so. For observers in the Northern Hemisphere, click on image on the left for details. For observers in the Southern Hemisphere, click on image to the right… the Perseid radiant never climbs above the horizon, which will considerably reduce the number of Perseid meteors you are likely to see. Nevertheless, on the night of maximum, it is possible to see 10-15 meteors per hour coming up from the northern horizon. The Perseids meteor shower is caused by comet ‘Swift-Tuttle’ crossing Earth’s orbit (on it’s way back to the Oort Cloud) thus Earth passes through the remaining comet debris. As discussed in March 2013 (above)….Emissions from the Oort Cloud (such as comets) seek to work with particular ‘aspects/rays’ of our planetary evolution, supporting our spiritual renaissance. The energetics of these comets are igniting within our hearts the desire to stand outside of the box of the old paradigm of non-conscious Earthly ways and dream our highest vision for self and humanity. Through our dreams and inspiration visions we transcend the problems of our world and emerge with infinite solutions. When we choose to walk the beat of our own hearts in truth, authentic love, compassion and reverence for all of life…. the dreams of our higher-selves ‘meet up’ in the etheric field… such that our single-cellular dreams join with the dreams of others to become multi-cellular dreams. 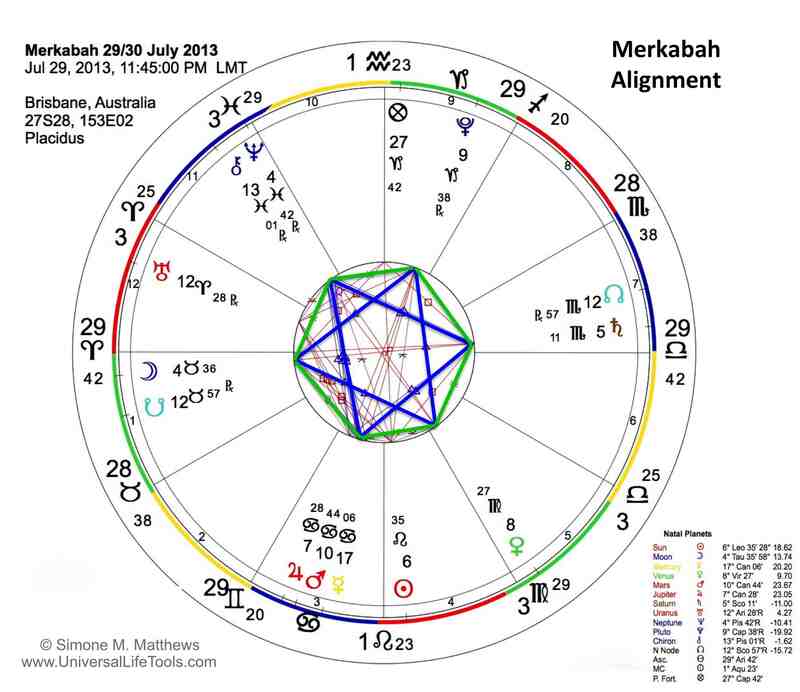 Grand Sextile – Merkabah Alignment: .As mentioned above, on the 25/26 August 2013, a second Star of David and energetic counter-rotating Merkabah will be formed by the planetary alignments. This second Merkabah formation is a twin Merkabah (a twin is a Merkbah formation within one month of the first Merkbah). The last time a twin Merkabah was seen was in 1996. These twin ’6 pointed Merkabah Star formations’ are together activating our 12 pointed Merkabah Body of Light. Thus our activated 12 pointed Merkabah Body of Light (through the 13th central point), is the vehicle that supports our conscious connection with the 13 Spheres of Metatron’s Cube. It is the vehicle that supports the awakening of our DNA and our quantum leap into enlightenment. Please read my full article to understand more about the 12 Pointed Merkabah Body of Light as well as download a ‘Crystalline Merkabah Grid’ to use in August 2013. Aurigid Meteor Shower – 1 Sept 2013: The Aurigid meteor shower takes place 25 Aug to 6 Sept, with the peak occurring on the 1 Sept. Although this minor shower typically produces only 6 meteors per hour under optimal conditions, it occasionally performs much better. 1935, 1986, and 1994, and viewers recorded up to 130 meteors per hour in 2007. No one knows when the shower will burst out again, but the waning crescent Moon provides minimal interference this morning, so it’s a good time to check the shower out. The comet Kiess (C/1911 N1) is the source of meteors and has an orbital period of approximately 2000 years. Not only is the shower rarely seen, the Aurigid meteors also may be very unusual, Jenniskens noted. They are solid bits of the icy comet Kiess that returned from the Oort cloud of comets on the outskirts of the solar system. “Billions of comets have spent 4.5 billion years in the Oort cloud, where cosmic rays baked their crust over the age of the solar system,” Jenniskens said. “Some of the Aurigid meteors could be bits and pieces of this original crust of the comet. Comets that return more frequently to the sun have long lost this pristine crust,” he observed. Spring/Autumn Equinox – 23 September 2013: The Spring Equinox (Southern Hemisphere) and Autumn Equinox (Northern Hemisphere) falls on the 23 Sept 2013. Sun enters Libra on the 23rd for Spring/Autumn Equinox. The Equinox is where day and night are of equal length – the energies coming together as one – Heaven & Earth, Spirit & Matter. Whilst the southern hemisphere is preparing for their re-birth as they awaken from the sleep of winter, the northern hemisphere is bringing her energy inward, in preparation for the rest ahead. It is our polarities that make up the whole. The Equinox is a powerful portal gateway to ascension into higher levels of consciousness. At this time of unity, the feminine & masculine merge as one, opening opportunities to unify duality within our selves, and expand our awareness to greater dimensional/light octave levels. 19 Oct 2013 – Penumbral Lunar Eclipse: A Lunar Eclipse is where the Earth blocks the suns rays from partially/fully reaching the moon. A Penumbral eclipse is where the Moon is within the Earths penumbra (shadow). Thus in a sense the ‘past’ can be dissolved during the Eclipse as one moves forward in the now (as the moon is no longer shadowed by Earth). The lunar eclipse aspect is about working on your inner self, and illuminating yourself from within. Here is a image showing where the eclipse will be visible in your place within the world. Halley’s Comet is the source of the Eta Aquarid meteor shower. Every year, our planet Earth crosses the orbital path of Halley’s Comet in late April and May, so bits and pieces from this comet light up the nighttime as Eta Aquarid meteors. This shower is said to be active from April 19 to May 20, although Earth plows most deeply into this stream of comet debris around May 5 or 6. The comet dust smashes into Earth’s upper atmosphere at nearly 240,000 kilometers (150,000 miles) per hour. Roughly half of these swift-moving meteors leave persistent trains – ionized gas trails that glow for a few seconds after the meteor has passed. The diagram on the left shows the path of the eclipse…the dark strip in the center indicates the best locations for viewing the eclipse (Moon moves centrally in front of the Sun). The eclipse is also visible in the areas that are shaded red, but less of the Sun’s disk is obscured. The fainter the red shading the less of the Sun’s disk is covered during the eclipse. Orphiuchus – up to 17 Dec 2013 – There is a constellation in our heavens called ‘Orphiuchus’(pronounced Or-fee-you-cuss). It is sometimes referred to as one of the 13 Zodiacal signs (though that is a discussion for a completely different article !). Our Sun passes through Orphiuchus from the 30 November until the 17 December each year. The constellation Orphiuchus is represented as a Serpent Holder – a man holding a serpent. The serpent holds the wisdom of medicine, the power of nature to bring health and well-being and the knowledge to ‘heal thyself’. Whilst this Zodiacal sign is not included in our 12 Zodical system in common use today, I have always felt that the energy of Orphiuchus exists in each and everyone of us, as if we ourselves are the 13th Zodiacal sign… it is just a matter of awakening and acknowledgement of this oneness. As a side note here, it is interesting that the ‘Caduceus’ (2 entwined snakes on a rod) is the sign of the medical establishment of today. The Maya talk about how every 13,000 years we enter a period of change here on Earth. During our 26,000 year journey around Alcyone, every 13,000 years we are in the mid period of the photon-belt, a region of highly charged photons. It is at this mid-point that the Maya say the ‘Serpent (Snake) Rises’ and the potential for individual and planetary awakening is at its peak. During the last 13,000 year crossing we were in the Age of Leo, and through the Solar Plexus embellishment of the ego we experienced the destruction and subsequent sinking of Atlantis. Now as we enter the 13,000 year midpoint once again, in 2013 and the Age of Aquarius, we are acknowledging the Serpent (snake) within each and everyone of us, through the Heart… we are awakening and being empowered by the truth of Oneness. What is interesting in 2013, is that in Chinese astrology we are entering the year of the yin Water Snake. This year, through the power of the number 13, humanity is awakening to the sensuality and powerful creativity of the Divine Feminine from within. The snake, representing rising kundalini and transformation, the number 13 expressed through the 13 feminine moon cycles of menstruation within a solar year and the element of water… creates a flow, a fluid rippling of the creative, feminine and mystical energy through the hearts of humanity… an awakening to the Divine Feminine from within. Thus as we come to the end of 2013, from within our hearts, we are bringing harmony, balance and divine union of the masculine and the feminine… it is from this place that we co-create the utopia that is the Golden Age. This will mark the shortest day of the year in the Northern Hemisphere (daylight hours) due to the tilt of our Earth. It is a time of inner reflection, turning to the Sun within, our solar selves. It is a time to gain strength from within, and get ready to embark on the new journey as our days of daylight get longer, and we are being energised from within. This will mark the longest day of the year in the Southern Hemisphere (daylight hours) due to the tilt of our Earth. The peak night of the 2013 Geminid meteor shower is expected to be from late evening tonight (Friday, December 13) until dawn tomorrow (December 14). The meteors will be flying, but will you see them in the bright light of the waxing gibbous moon? The brighter ones, yes, and the Geminids do tend to be bright. If you want a moonless sky, your best bet on this night is to watch in the narrow window between moonset and dawn on Saturday. To optimize your chances, get up early on Saturday and drive out into the country, where you’ll have the darkest possible sky. If you do that, you might see dozens of meteors per hour! Follow the links below to learn more about the 2013 Geminid meteor shower. These words so eloquently summarise what the magic of 2013 (twenty-thirteen) is all about. As we walk over the threshold and enter our first steps into the Golden Age, it is time to transcend the limited perception of our differences. Through our hearts we are being called to weave the truth, the knowledge of our ancestors, the universal wisdoms of creation into the one cloth of unified LOVE. All that you need is within you. The year 2013 is calling you to ‘think through your heart’…as this is the key to accessing the wisdom of our ancient ancestors, the wisdom of the creation. Your heart unlocks this wisdom held deep within your DNA… LOVE yourself enough to unlock the truth within you and set yourself free. Note 1: There are many astrological happenings throughout 2013… however for the brevity of this article I have highlighted a select few. Please refer to my monthly newsletters for a more detailed overview of astrological / energetic events. Note 2: Interestingly too is that 13 x 20 equates to the 260 day cycle of human gestation, and after 59 Mayan Calendar Ritual Years (made up of 260 days each) we have cycled 42 Solar years. The number 42 is a sacred number in creation; as sound becomes light when it moves 42 octaves… or in other words, physical becomes spiritual. Also there are 42 numbers of the Hebrew Alphabet, 42 degrees is the angle of light reflection off water to create a rainbow, in the Kabbalah 42 is the number that God create the Universe, in ancient Egyptian Laws there are the 42 Principles of MAAT and in numerology the word ‘Archangel’ resonates to the number 42. Note 3: On the 5/6 June 2012, Venus passed directly between the Sun and the Earth, making the path of Venus visible from Earth against the backdrop of the Sun. Venus crossed the face of your Sun on the 8/9 June 2004 and then did so again on the 5/6 June 2012. The transit of Venus always occurs in pairs 8 years apart, every 121.5 and 105.5 years, creating repeating cycles of 243 years. Venus represents The Divine Feminine, the inner vibration of the heart through harmony, pleasure and beauty; Whilst the Sun represents our masculinity, the outer expression in the world. As Venus transits the Sun, it is also in the sign of Gemini, the sign of communications with self, and our relationships with others. The eight year period between transits represents a doorway, a gestational period of creativity, feminine intuitive vision, and fosters greater clarity and truth to our inner most desires and feelings. The transits then represent an awakening of the Divine Feminine, a return to communicating through our hearts, from a place of love, compassion and reverence for self and others. The next Venus transit will seen again here from Earth in December 2117.